It's common knowledge that a story which is incredibly popular on Reddit won't necessarily register a single Like on Facebook. But the same is true the other way round, too. Reddit users couldn't give a flying crap about most of the nonsense that gets poured into Facebook. Zuckerberg? Puh-lease. And let's not get started on attention-seeking Twitterers who only care about the wisecrack, or the handful of lonely Google+ users intent on... actually, I'm not sure what they're intent on. Does anyone? 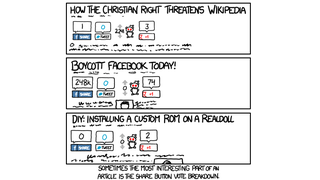 Today's XKCD cartoon nails this exact point.